There are a time in life when you can enjoy the fruits of your labour and treat yourself to a weekend break in a country cottage and a few pampering treatments or pleasures. Fortunately, a wide variety of holiday cottages and log cabins are available to rent on a self-catering basis for week long lets or short breaks. Working couples tend to prefer three night weekend breaks that run from Friday until Monday morning. Tagging two days onto a weekend makes the most of any holiday entitlement. Touring the UK and Ireland can be most enjoyable, especially when the weather is good and you can get out and about to see the local sights. Sometimes the most unexpected situations occur and people so the strangest things. 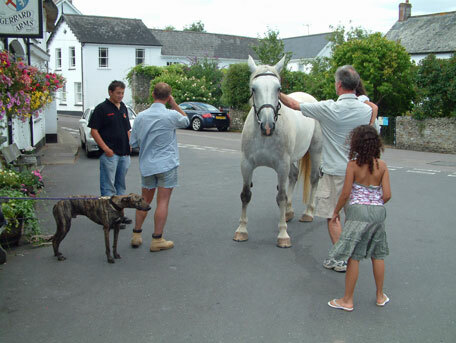 The photograph on the left shows people coming for a drink at a pub in Devon and tethering their animals outside, including the horse. Cottage holidays can be a good way of discovering a new part of the country during a holiday or long weekend break. Find a cottage just for the 2 of you and discover new pleasures and scenery in a different destination each time. Enjoy a relaxing break in a luxury cottage amidst the greenery of a tranquil spot in the country. Awake to the sound of a cockerel or bird song. Let your first view of the morning be of rolling hills or a seascape. Go for country or coastal walks, go shopping and perhaps theatre in the evening. A cottage break provides good comfortable accommodation, there is a range of standards up to luxurious 5 star at the top end. 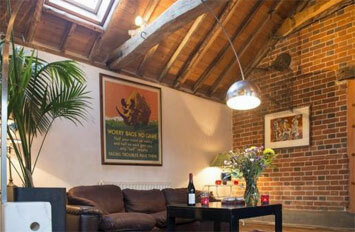 5 star holiday cottages for couples offer the very best of accommodation in the UK. Choose a cottage to your liking and tailor the rest of your holiday to provide the things that you would like to do and see. Five star accommodation frequently has optional extras that guests can request, for example, beauty treatments, massage, gourmet meals delivered to your cottage and complementary access to local golf clubs and spas. Fresh flowers, or welcome packs of wine and chocolates are considered standard. Welcome packs vary from one cottage to another.